At the end of 2004, I began attending a friend’s church in Grandview, Missouri. 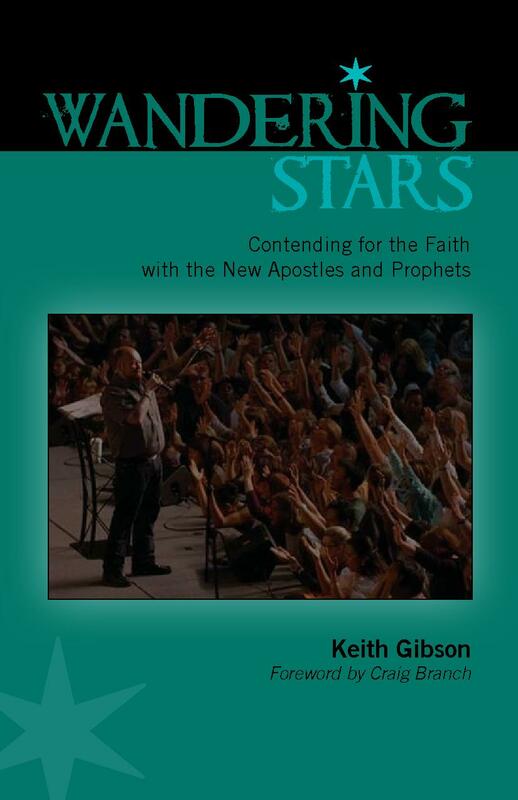 The pastor there was Keith Gibson, who has now authored a book called Wandering Stars. I enjoyed years of his sermons, many of which spoke to the fallacies of cults and how to witness to these confused individuals. To find out a little more about this novel, I decided to conduct an e-mail interview with Keith. Enjoy. Could you tell us a little about yourself? I was essentially an agnostic as a teenager. I had a great number of questions for which I couldn’t find answers. A friend in a local youth group invited me to attend a conference with Josh McDowell on Christian evidence. It was the first time that I began to understand that the truth claims of Christianity were intellectually defensible. I converted to Christianity in my first semester of college. I began to prepare for the ministry shortly thereafter. I’ve now been in the ministry for nearly 27 years. I am passionate that Christianity is Truth. Is this the first book you’ve written? Where else has your writing been published? This is my first book. I have published a number of articles previously. Most of them have been for the Areaopagus Journal which is our ministry’s publication. However, I have also been published in the Journal for the Midwest Christian Outreach. I have done research work for books written by others. Many years ago I had an article published for Missouri physicians on dealing with worker’s compensation issues. I have a couple of other writing projects working right now. Can you give us a brief outline of what your book is about? There is a growing movement within certain segments of Christianity right now of people claiming to be apostles and prophets of the same character or even greater than those in Scripture. These new leaders are introducing doctrines that the church has never believed in its history, many of which contradict direct statements of scripture. The book is a response to this movement. After taking a few chapters to deal with general subjects related to the overall topic – such as whether or not apostles and prophets exist today – the book outlines major doctrinal issues where these teachers are deviating from orthodox Christianity in the nature of God, the person of Christ, the atonement etc. Who would this book be most helpful for? Pastors, youth pastors, parents of teens and young adults since the movement targets young people. What of your experience has given you the expertise to write this book? I have eight years working formally in the field of apologetics, twenty-seven years as a minister. I hold a Master’s Degree in Religion. The biggest thing however, is that I spent seven years investigating the movement in question. What drove you to finally sit down and start writing this book? I believe the doctrines of the movement are a significant departure from orthodoxy and present a true challenge to the church’s understanding of God. I originally approached teachers I respected who are more closely aligned with this movement than I and asked them to do a book. When I couldn’t find anyone willing to address the subject, I decided to tackle it myself. What was the hardest part of writing this book for you? Was there a particular chapter that you put off writing due to its difficulty? The hardest part was reading the statements made by the leaders of this movement aimed at those who disagree with them. The most difficult chapter to write was the one on the biblical tests for a prophet because it is the most technical. Was it always planned to be a book, or did it start out as an essay or an article for a Christian newsletter? The intent was always to produce a book. However, I did write a newsletter article along the way just to get some of the material out there for people to use. Did you have to travel any to gather resources for your book? Visit any worship sites for these groups? Kansas City is one of the key cities for this movement so I did not have to travel far. I have attended worship services. I’ve also interviewed current and former participants in the movement. I read nearly 200 books published by leaders in the movement, listened to hundreds of sermons and read over 7,000 prophetic messages. From my few years attending your church, you always seemed to have a great fascination with false religions, cults of Christianity, and even non-Christian cults. Could you tell us why that is? As I said, I am convinced passionately that Christianity is Truth. I think it is so important that we engage others in the marketplace of ideas to defend the claims of Christ. In order to effectively communicate the Christian message, it is important that one have at least a rudimentary knowledge of the beliefs of others. Additionally, I see countless people laboring in false religions to try to earn the salvation Christ will give them for free. What considerations would someone need to make when witnessing to these groups that would be different from witnessing to the average lost person on the street? Most of the people in this particular movement are believers in Jesus. However, one needs to understand their view of Scripture and especially modern revelation. Further, I think in sharing with those in this movement about its dangers one will need to be prepared to demonstrate those dangers and to counter the typical responses of those who support the new apostles and prophets. I hope that this book will give readers the tools and information necessary to do that. When is your book due out? Early this December. Are pre-orders available? Yes, the book can be ordered now at a website set up just for that purpose at Gibson Apologetics. Where can we order it? I would prefer that readers order the book at Gibson Apologetics. The book can be ordered there right now. In a very short time it will also be available at our ministry website Arc Apologetics and directly from Solid Ground Publishing. I’m sure you have a very thorough Works Cited page in your book, but are there any other books you would recommend on this subject that might have been an influence but not direct source material? There are nearly 350 end notes in the book. To my knowledge, it is the only book of its kind. However, another good book is The Other Side of the River by Kevin Reeves which is the personal story of a person who has come out of the movement. Weighed and Found Wanting by Bill Randles is also good but the material is a little dated. Can we expect more books in the future from you? I hope so. Do you have anything specific that you want to say to your readers? What a person believes matters. False doctrine can destroy you. Thanks again to Keith for taking the time to do this. I look forward to reading and sharing it with my friends and family.